Since their introduction into heavy-duty applications, automatic tensioners have largely replaced locked-center tensioners on serpentine belt drives - for good reason. 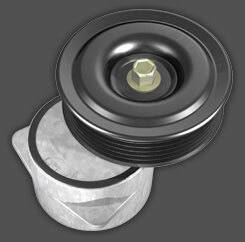 They increase the life of the drive belt and accessory bearings, and reduce maintenance and downtime. Automatic tensioners apply a constant force to the accessory drive belt, compensating for belt wear and changes in operating loads. When optimum tension is maintained, belts last longer and noise problems decrease. Gates DriveAlign™ automatic belt tensioner is designed to resist extreme vibrations while providing stable damping for the life of the engine. The DriveAlign™ tensioner's ability to absorb extreme vibration means that it has high damping levels so that tensioner motion and fatigue of the inner torsion spring are reduced. In addition, the universal design can be set up at the factory to provide tension in either direction, depending on the application. A steel pulley with twin rows of ball bearings that minimize friction, wear and noise. The fit of Gates Green Stripe DriveAlign tensioners matches the OEM design and provides maximum coverage with minimal inventory – 22 part numbers will cover more than 1,200 fleet and heavy-duty aftermarket applications. The fit of Gates Green Stripe DriveAlign tensioners matches the OEM design and provides maximum coverage with minimal inventory – 22 part numbers will cover more than 1,200 fleet and heavy-duty aftermarket applications. Since their introduction into heavy-duty applications, automatic tensioners have largely replaced locked-center tensioners on serpentine belt drives - for good reason. They increase the life of the drive belt and accessory bearings, and reduce maintenance and downtime. Automatic tensioners apply a constant force to the accessory drive belt, compensating for belt wear and changes in operating loads. When optimum tension is maintained, belts last longer and noise problems decrease. Gates DriveAlign™ automatic belt tensioner is designed to resist extreme vibrations while providing stable damping for the life of the engine. The DriveAlign™ tensioner's ability to absorb extreme vibration means that it has high damping levels so that tensioner motion and fatigue of the inner torsion spring are reduced. In addition, the universal design can be set up at the factory to provide tension in either direction, depending on the application.